It’s nearly the end of August and once green lawns are now gold and the constant heat, sunshine and drought has curled my edges and set in fatigue. Mornings are cooler now and leaves are starting to look like rust, though I’m sure it’s the drought that has plagued us all summer rather than the early start of fall. It’s a very odd uneven time, indeed. A week ago we were camping in the the Wenatchee National Forest near Leavenworth, close to amazing hikes and fresh air. It was where I discovered that I hated quaint touristy faux-Bavarian towns, but loved the golden hills full of orchards along with the bakery, a pioneer village/small town museum and tasty beers of the next town over. This short get-out-of-town break was just what I needed. And now that we’re back home where there’s lots of work to do and long to-do lists, I feel a world better. Perspective is important and that’s why little jaunts out of your world help to bring new eyeballs that see within as well as out. I’m feeling better than I have in months. Yay. My good friend isn’t a fan of August. I get it and obviously Sylvia Plath nails the feeling well. So to help move this transition month along, I made cookies. There’s no flour and that probably means good things to a few of you. In fact, I made this recipe because I was out of flour. I was also out of brown sugar, but a text to my neighbour netted results. They are good. 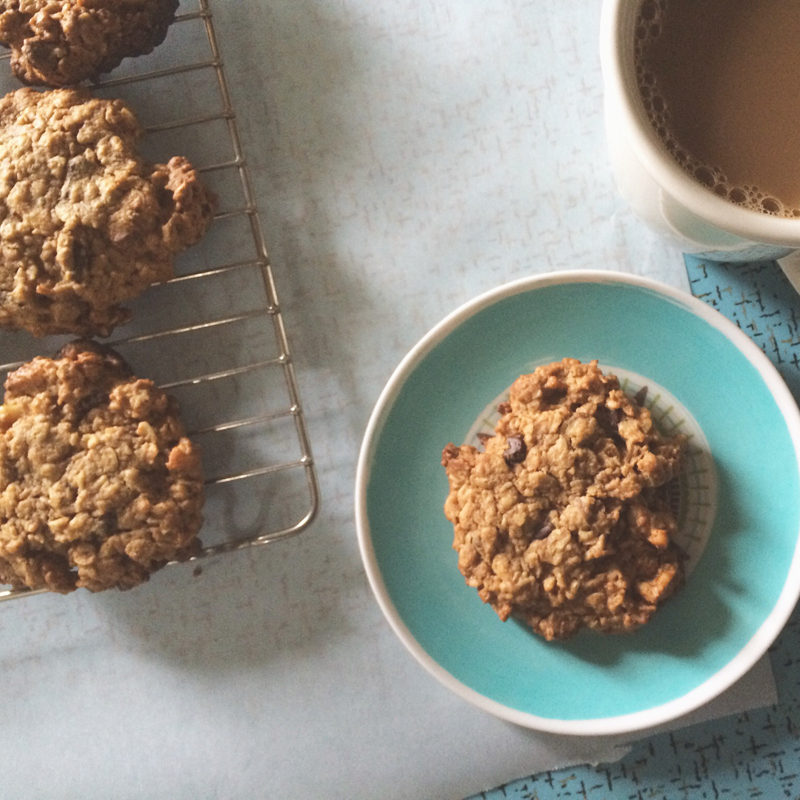 Slight chew, slight crispness and packed with large flake oats, chocolate chips and walnuts. Peanut butter helps bind things together and while the flavour is there, it’s not the number one flavour here. Make up a batch and wait out the rest of the month. Take a few on a picnic for one last hurrah. Maybe these cookies aren’t fully loaded, but I think they’re pretty jam-packed with walnuts and chocolate chips. You could easily get rid of the walnuts and go all chocolate or try raisins instead (though I don’t know why you’d want to). In a medium bowl, mix together the butter, peanut butter and sugars until creamy. Beat in the egg and then the vanilla, baking soda and salt. Dump in the oats and stir, and then stir in the chocolate chips and walnuts. Cover baking sheet with parchment paper or use a silpat mat. Drop dough by the spoonful and flatten each cookie slightly with your hand. The original recipe said that these cookies were spreaders, but I didn’t find that too be the case. Use your discretion! Bake for 15 minutes or until golden. Let them cool slightly on the baking sheet before removing them with a spatula. Makes about 16-18 cookies. This my absolute favourite kind of cookie – hearty, oat-y, and nutty! I may need to make a batch tonight! Just wanted to say that I made these and subbed raisins for nuts, and they were a hit at the office – many people asked for seconds! Thanks Jeannette, these cookies are yummy and were so quick and easy to bake up! Perfect treat for the weekend. Still hot and muggy in Toronto combined with dark mornings and shorter evenings. Amanda, yes, I hope you made a batch, they’re so tasty! Kelly, you went with raisins! Glad they were delicious. So glad you enjoyed these, Caterina! 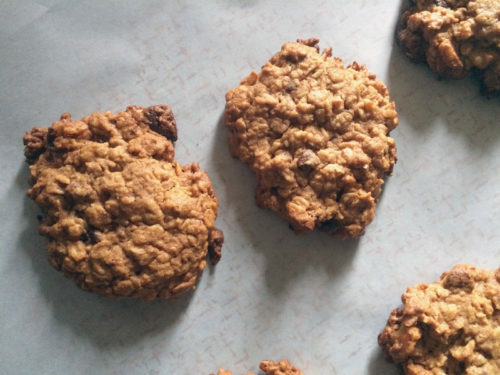 I made a batch and baked just one pan full and they were perfect, warm and chewy. Thanks for the recipe! Susan, so great to hear it!